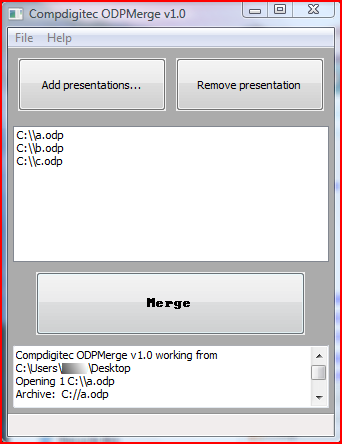 Compdigitec ODPMerge is a small utility written in cross-platfrom wxWidgets C++ to merge multiple OpenDocument Presentation (OpenOffice.org Impress) files into one. 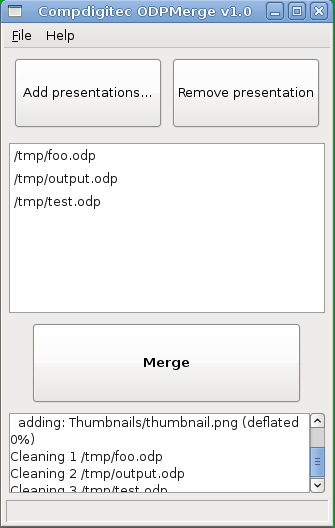 Since OpenOffice.org's built in slide importer only allows for importing one .odp at a time, this utility allows you to merge unlimited (only limited by the system's processor and memory) amounts of presentations into a single presentation. No binaries are available for Mac OS X at the moment, but you may attempt to compile the source on Mac OS X. Please contribute if you can! © Copyright 2008 - 2014 Compdigitec. All rights reserved. Last updated on May 8, 2010.